Honestly, configuring this has been such a hard experience. I encountered many errors already, one after another but am stuck now. To illustrate what I've come across so far, I've had problems with user permission (I've now configured an Unattended Service Account) then ran into problems with missing OLE DB (installed correct version then added to Trusted Data Providers). I'm experiencing a new problem now and have become stuck as I have no idea how to fix it or why it is like that. Based on my troubleshooting using SharePoint Log Viewer, my workbook cannot refresh because "The Microsoft Access Database Engine could not find the object 'Sheet1$'". I've checked the original source file (which is uploaded into a Document Library) and its there! Also, I have no trouble refreshing the data using the desktop application, its only when its uploaded to SharePoint that it throws out that error. 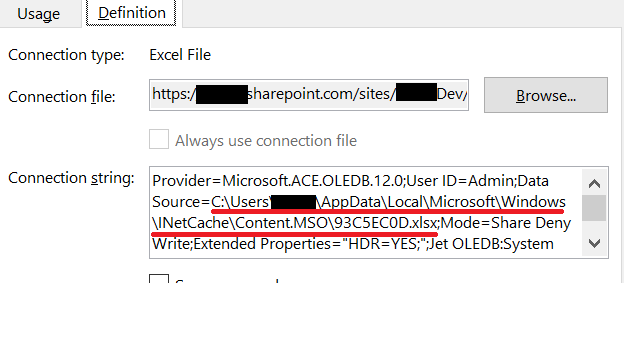 It seems that what happens is, everytime I try to refresh the data from SharePoint, it 'creates' a temporary file as specified there in the connection string above instead of using the original Excel file (which is also uploaded into SharePoint). I tried accessing the file but it seemed to be corrupted or locked by some service / user. The problem is that I CANNOT change anything on the connection string. I've tried changing the Data Source URL manuallly to point to the data file (it's the one in the "Connection File"). However, any change I make just reverts back to an automatically generated connection string whenever I save the properties. Can anyone enlighten me on this and why it is this way? Or if there is an alternative approach to doing this (or is it possible to use External Workbook as a data source at all)? Any one have similar experiences and solved it? In Existing Connections window,click "Browse for More"
In the Ribbon, click "Connections"
Go to "Definitions" Tab -> Authentication Settings. Change Authentication Settings to None to use the Unattended Service Account. In SharePoint, go to a Page and insert an Excel Web Access Web Part. Connect the Web Part to the DataReport.xlsx workbook. Try to refresh data. It should result in an "We were unable to refresh external data..." error message. Note: I've configured and confirmed that the Unattended Service Account and Data Refresh is working, by configuring another workbook which pulls out data instead from SQL Server. I've also encountered a missing OLE DB driver error message, but have fixed that already. Browse other questions tagged sharepoint-enterprise excel excel-services external-data or ask your own question. Unable to refresh data for a data connection in the workbook.